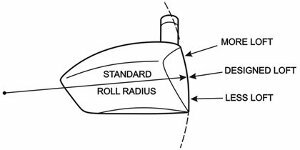 To understand this new concept of graduated roll technology in driver face design, we must first look at what has been standard in heads over the years. 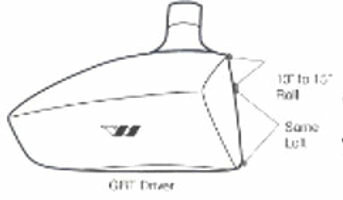 There are two different radii incorporated on the face of all golf drivers heads- a horizontal curvature called BULGE, and a vertical curvature termed ROLL. While there is definite scientific proof of the value of BULGE, no such reason has ever been explained for the presence of ROLL. Yet all wood heads have been made with vertical ROLL radius since the beginning of the 20th century, until Tom Wishon, in the middle 1990’s started incorporating his graduated roll technology into his driver heads.